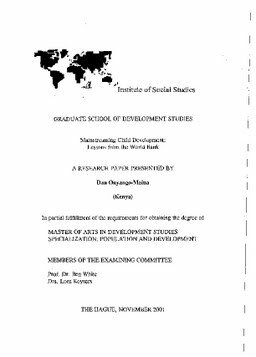 This study sought to find out whether child development has been mainstreamed in the World Bank's development operations between the years 1970 and 2000. This study is premised on the argument that adequate child development makes both social and economic sense. Child development is fundamental to the social wellbeing, economic prosperity, political stability, and even environmental integrity of a society (Young 1996; Selowsky 1981; UNICEF 1966; Myers 1992; Evans et al. 2000).